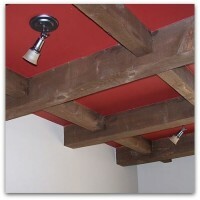 Ceilings and Ceiling Treatments are just as effective at defining space as are floors, flooring materials and walls. The proper Ceiling Treatment in a room (or space) can create an area that has Pizzazz and Flair, while the wrong (or no) Ceiling Treatment in a room can lend the room to being just that another room. The Flooring Elements should lead the eye to the Architectural and Design Elements of the Home and these should lead the eye to the Ceiling Elements of the home. It is an entire and integrated package.